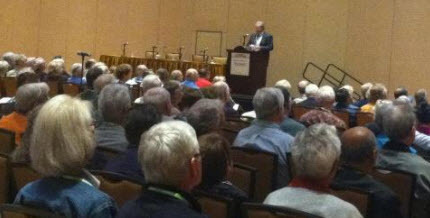 Don’t get me wrong, I have nothing against gray hair — the invasion has begun at my own follicles (much more cost-effective than my spouse’s highlighting) but as this image from the MoneyShow (and Louis Navellier) shows, it’d be nice to see some hair color diversification in this audience. We have much to do to engage a nation of investors, including the young people who want to secure better futures with long-term successful investing. YES!! I was there and it was very gray all around me. The younger generation was in the Exhibit hall manning the booths & handing out free stuff. I can only hope they took some interest in the companies that were there, and in investing in general.